What makes a woman strong isn't something you can see. We like to think we can tell a lot about a person simply by looking at them. We think we pick up cues by what people wear, what they eat, the way they talk, what they drive. The list is endless but evaluation by appearance is also flawed. Can you really tell what life is like for someone because of what they post on Facebook? Can you see just by looking at a woman that life hasn’t gone to plan and she has had to find the strength to change everything? Stacey Currie should be living on the streets, in jail, on drugs or dead. She ticks all the boxes when it comes to risk factors, having grown up without her mum, being brought up in housing commission, sexually abused, pregnant at age 15, with 2 babies and homeless at age 19. By the age of 21 she had 3 kids and was living in a violent relationship. Stacey Currie and her son. One night in hospital, after a terrifying domestic violence incident with her partner, Stacey was given a choice by authorities. Stay with your partner and your children go into foster care tonight, or leave him and keep your children. Stacey chose her children, and then bit by bit; a job at a funeral home, weekly therapy for herself and children, and a burning drive to have a better life (one that she didn&apos;t even know existed until she left her abusive partner), she changed everything about her world. Stacey is now 36 years old and has five wonderful children, a beautiful and supportive partner and is an author, international speaker, and runs a successful business, Brand Print Australia. "Don&apos;t allow other people to get in and sabotage you," Stacey says. "Go with your own self belief because that&apos;s what&apos;s going to take you to where you need to be." Nicky Lavigne always knew she wanted to be a mum. Married for her 30s it seemed like an imminently possible dream, except it wasn&apos;t. It didn&apos;t happen and then she turned around one day and she was 40 and single. Nicky Lavigne with her twins. Nicky spent four years and had seven unsuccessful IVF cycles before making the decision to use an egg donor. As it was not a procedure readily available in Australia, she travelled to Athens, Greece on the recommendation of her fertility doctor. Thankfully, the baby gods were smiling the day she had her transfer and blessed her with two absolutely divine tiny humans. Her twin boys are now two and Nicky is busy and in love. "My plan when I was young was to have babies and be in this wonderful relationship with their father," she says. "But it didn&apos;t happen. And I was always someone who wanted to be a mum. It was what I wanted more than anything." Katie Brett was living the dream when she decided “the dream” might not be for her. Having established a successful PR career, Katie was living in London and was engaged to be married to a man who wanted for nothing. They flew to parties by helicopter, holidayed in the most idyllic of locales, shopped in luxury stores. But on the eve of her wedding Katie made the life changing decision to return to Australia alone. The relationship looked fabulous from the outside, but from the inside it was toxic. Watch these three inspirational women speak at the Debrief Daily and Poise event below. Post continues after video. Katie came home to Australia with nothing but the clothes on her back. Jobs were hard to find. So she took a leap of faith and reinvented herself as an entrepreneur doing the very thing in life that gave her joy - being with dogs. Katie, 41, now runs a successful dog walking business .and she couldn’t be happier. The three very different women are proof that we don&apos;t know anyone&apos;s story until we talk to them. 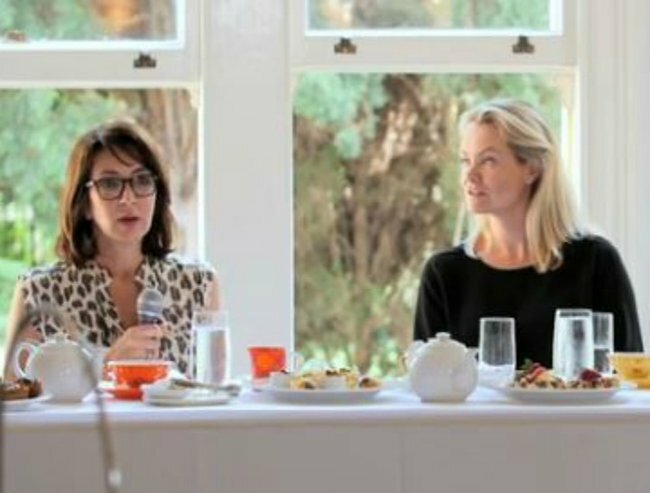 Guest speakers at a Poise and Debrief Daily breakfast celebrating women who have re-invented themselves, these three prove that you cannot see strength, and you do not know what anyone&apos;s story is until you talk to them, or rather, listen. "We all compare our real lives to other people&apos;s highlights reel and you never know what&apos;s going on behind the scenes," host of the breakfast, Mia Freedman said. "Everybody&apos;s got a story, and in this case, here are three incredible stories of reinvention and inspiration."